The Universal Daycare System (also known as Preschool for All) is a government funded education program that gives all children access to early learning. Many state governments are in the process of adding such programs to their education departments. It was the bargain of the century. An avalanche of demand followed. The existing structure caved in under the pressure and an urgent need for the creation of new spaces was undertaken by the Ministry. Daycares opened at a fast pace. A new law and regulations were decreed over the land. The law established new levels of standards. Those standards called for education programs, for the establishment of daycare policies, for the training of daycare personnel and so on. The ripple effect has touched most aspects of Quebec society. Many professions, from architects to child psychologists to colleges had to adjust their pace as they joined the effort in an attempt to accommodate the incoming respective demand. This book is therefore a contribution - and a tribute - to this historical movement which by now is established and entrenched in Quebec society. In the preparation of the book, I tried to establish a single-stop-shopping guide to daycare operations. Eventually, the reader, whether a student or a teacher, a parent or an educator, a coordinator or an aspiring owner, should find answers to her questions in this single document." 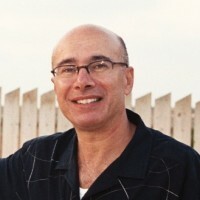 To become a dad, to find a suitable daycare, to set up a daycare, to get involved with the daycare system, to give college- level lectures in Early Childhood program, to design and construct establish daycares, to participate in ministerial policy making, and finally (or latest-ly, to leave behind a testimonial - this book. What is the Most Important Lesson That a Child Should Learn? I should hope that they do not let their education interfere with their children's development, creativity and growth. In my teaching, I emphasized that all I give to my students is a flashlight; to expose problems and to shine light where darkness reigns. 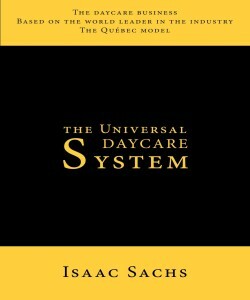 Do You Think The Universal Daycare System is the Right Move? The universal daycare system is the right approach to a society which places value on the integration, independence and freedom of its citizens. It allows for new parents to pursue their careers with the knowledge that a state-funded (not state-run) system minimizes or eliminates a major financial / social / cultural burden. The Quebec society is composed of a significant influx of immigrants. Many programs are offered to these new families in order to allow them to integrate into society and to become productive members as quickly as possible. The Quebec universal daycare approach is a major part of this integration effort. What are the Benefits of Early Academic Learning for Children? We see the results; our 'graduates' very often come back to visit us. The words of praise and the pride expressed by the parents about their child's achievements are the best endorsement. Care should be taken, however, to keep the preschool as a child care center. It is really not a 'pre' anything. It is a fun and care center by its own right. Who are in Charge of The Universal Daycare System Curriculum? Ultimately the children are in charge. We are here to interpret. How Does the Government Ensure Proper Care for the Children? Every daycare must build its own education program, adapted to its environment. My book dedicates a whole volume on this complex and compounded subject. The government inspectors receive a copy as part of the required documentation in the licensing procedure. Another important document produced by the daycare is the Internal Rules and Regulations, which spells out non-academic issues such as educators' responsibilities, parents' involvements and admission policy. Another volume is dedicated to this topic in my book. Can This Daycare System Be Implemented in Other Countries? The Universal Preschool Program is flexible enough that it can certainly be implemented in any society. What is needed first is a deep governmental commitment. Then a set of values will be prioritized. Finally there is the need for participation across the society as a whole, because the finished product will affect all its aspects. The 'Universalization' Program will generate increased work load in such fields as: legislation, logistics, architecture, psychology, software programs, computers, collegian education, construction, transportation, food preparation, hygiene, nursing, along with small peripheral business such as publishers, cleaners and caterers. What are the Weakness of the Universal Daycare System? Any program, in which public money is offered, runs the possibility of misplaced allocation. Quebec has resolved the issue by having nearly each subsidized dollar earmarked and verified by sets of control ratios where the some daycares see an increase of their allocation at the expense of others who are penalized for not maintaining the required performance ratios. Hence, the governments' annual allocation envelopes are maintained without - or little - deficits. Who are the Target Readers of The Universal Daycare System? My book is designed to be a single-stop information center to anyone or any organization which comes into contact with child care; the reader may be a teacher or a college, a parent struggling with this new stage in her life, a community organization which is laying down the ground work for a community preschool, or an aspiring owner with an entrepreneurial spirit. Also targeted are existing institutions who are looking for ways to improve their services.